Recently stumbled upon another indie bundle kind of site and decided to make a short list of some of the more established bundle sites. Here is a list of sites that I have compiled quickly for your reference (not really exhaustive and does not cover every single indie bundle out there in the World Wide Web). If you know of any other sites that are offering great bundles, do feel free to leave a comment or contact me and I’ll update the list accordingly. One of the oldest and most popular bundle sites that made such bundles famous, the Humble Bundle offers amazing indie content and often tops them up with bonus stuff as time passes. The Humble Bundle allows the consumer to decide the way the money is split. It does have a bare minimum that you have to pay for administrative purposes. Bonus content is usually given if you beat the average price paid for at the point of time when you make your purchase. The OST for the games are also usually available for download. The Humble Bundle is a fantastic site to frequent (or simply sign up to their mailing list) if you’re interested in some of the more interesting and higher quality indie titles. Groupees is a site that started out roughly 14 months back, offering both music and games in their bundles. It is only till now (roughly around the date as of which this article is published) that the “Be Mine Indie Game Bundle” placed them in the radar of the mainstream public, and me of course. Not surprising as this very bundle offers some of the more amazing indie games out there such as Xotic and Sideway New York. The site allows you to pay any amount (with a min of a dollar) and different percentages (vary according to the bundle) goes to different charity organizations. 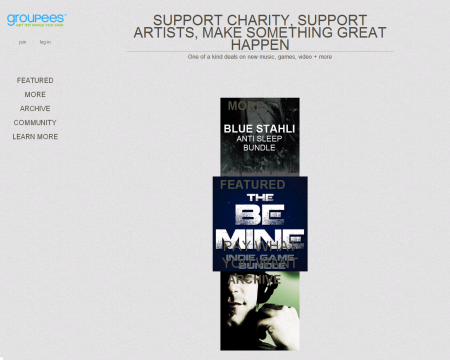 For example the “Be Mine” bundle will be donating 20% to Child’s Play. The site also provides the opportunity for top donors to receive unique things, such as original concept art signed and framed, naming rights to character in game that are currently in development and also things such as autographed CDs and t-shirts. If more of such bundles are being planned, Groupees is definitely a site that you want to have in your daily visits. Also, if you’re interested in other content such as music, e-books and all other sorts of digital content, Groupees does offer them as well. 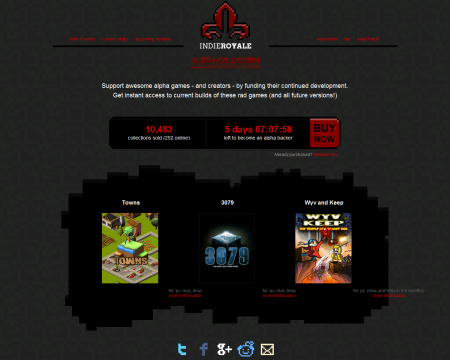 Indie Royale is another good bundle site that offers relatively good indie games. Their bundles (in my honest opinion) usually consist of 2 to 3 average indie titles with the fourth one being one of the higher grade games. All bundles also start with a minimum that you must meet in other to purchase it. This minimum will adjust accordingly to the average amount that people choose to pay. Depending on the bundle, money collected usually goes to supporting the participating developers. New bundles are often introduced in roughly a monthly basis (though it is stated that bundles are introduced once every two weeks in their FAQ). It is a great site to keep an eye on as it does spring some surprises every now and then. 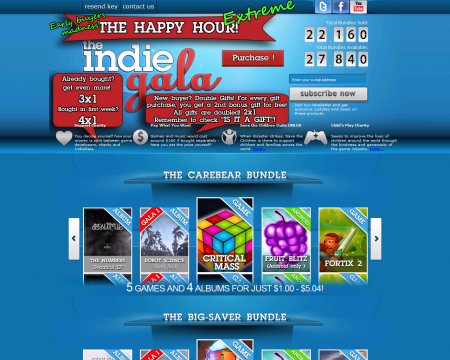 Indie Gala, the newest site within the list, introduced their first bundle December last year. 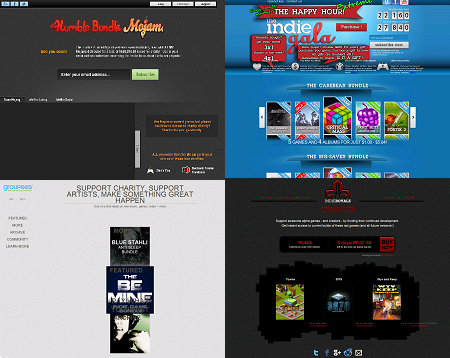 Their very first bundle included several high key indie titles for any price that you decide to pay for. 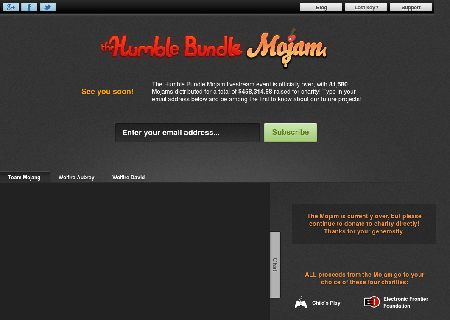 For the first bundle, paying above the average will entitle you to bonus content. Currently, they are using a tiered paying scheme where the price you pay for will fall within different tiers and each of the different tiers offer different content. You can choose the way you want your payment to be split among the developers, charity and the website itself. The bundles usually include music that may or may not be related to games. So if you’re into discovering new indie music, this is one of the bundles that will satisfy both your music and gaming interest. With the amount of content provided for each bundle so far, this is definitely a bundle site that you want to have in your favourites. They may be others out there at this point of time and there will be many more in future. If you have found any other site that offers decent bundles, do feel free to leave a comment or contact me. I will be sure to write something to give everyone a heads up on any new bundles that are released. As of now, these are some of the few sites that are more popular and established and will most definitely be sufficient enough to satisfy your gaming needs. Interstellar Marines: Will You Believe?